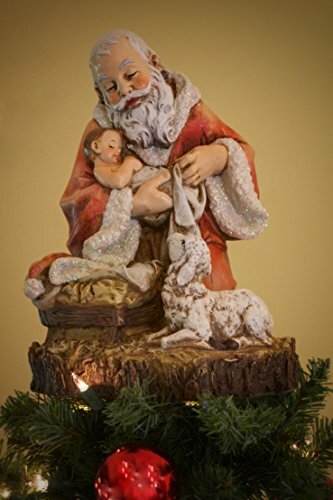 11.5" UNIQUE, Beautiful Kneeling Santa with Baby Jesus Christmas Tree Topper. 11.5"H x 8.75"W x 8.75"D. Made out of resin. Shipped along with The Shepherd's StaffTM for easy installation. Designed for artificial trees up to12 feet tall. Tree topper does not light up. Remarkable tree topper of Santa gazing onto Baby Jesus. Shipped along with The Shepherd's StaffTM, to attach to tree for easy installation. Topper made of resin. Designed for artificial trees up to12 feet tall. This piece is a larger item, looks best on larger trees. Tree topper does not light up.